Manny Pacquiao landed a quick left and right on Floyd Mayweather to start the ninth round and finished the round with another late flurry. Mayweather almost slipped early in the round after swinging and missing with a big punch. Pacquiao landed a left and right on Mayweather, who was showcasing his defensive prowess and managed to get in a few punches of his own during the eighth round. Floyd Mayweather, considered one of the best defensive fighters of all-time, also landed a hard right that stunned Pacquiao for a second followed shortly after by a left hook. Pacquiao and Mayweather spent most of the seventh round dancing around the ring until the Filipino southpaw landed a left hand during the final 40 seconds. Mayweather came out strong early in the round but neither fighter managed to land a significant punch. Pacquiao did his best to keep up his all-out attacking style on Mayweather but his undefeated opponent was unfazed, at one point shaking his head after the Filipino southpaw unleashed a slew of punches. Pacquiao, who has appeared to get the better of Mayweather to this point, also landed a straight left hand early in the sixth round. Pacquiao and Mayweather slowed down the pace of their fight during the fifth round on Saturday with the duo exchanging a series of shots. Pacquiao threw 16 punches in the round. Pacquiao had Mayweather pinned against the ropes during the fourth round on Saturday and unleashed a flurry of punches, including a left hand that seemed to stun the American. Pacquiao landed several punches on the body but Mayweather appeared to cover up and protect himself for the most part. Mayweather landed a right hand below the below the belt of Pacquiao during the third round of their megafight on Saturday but the Filipino southpaw kept a smile on his face. 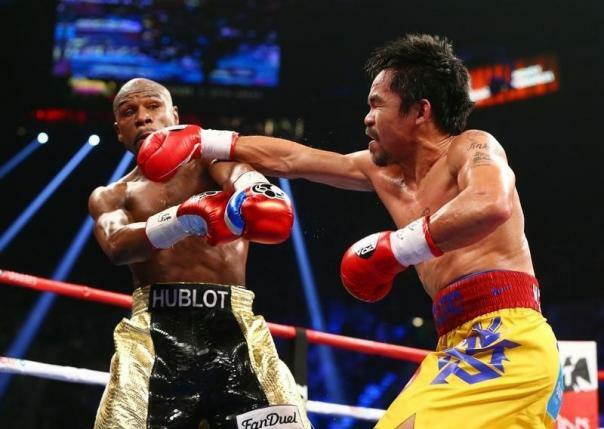 A big left hand from Pacquiao late in the third round narrowly missed Mayweather, who was caught along the ropes. Pacquiao landed a hard shot on Mayweather late in the second round of their megafight on Saturday. Despite landing the hardest shot of the fight up to that point, it was the Filipino southpaw who was chasing his American opponent around the ring for much of the round. Mayweather and Pacquiao spent the bulk of the opening round sizing each other up on Saturday. Mayweather landed a pair of hard right hand’s on Pacquiao during but the Filipino southpaw still had a smile of his face when the bell rang to end the round.